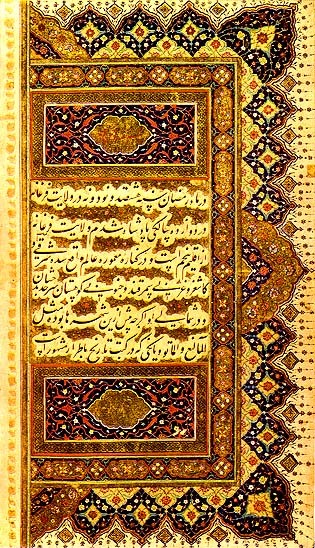 The “Memoirs of Babur” or Baburnama are the work of the great-great-great-grandson of Timur (Tamerlane), Zahiruddin Muhammad Babur ) 1483-1530). who dreamed of fulfulling his destiny as a descendent of Genghis Khan and Mongol Princes atop Salaiman Mountain in Osh and if fact conquered India and created the Mughal Dynasty. (See my post for his life story . Babur (14 Feb 1483 – 26 Dec 1530), born Zahīr ud-Dīn Muhammad, was the ultimate founder and first Emperor of theMughal dynasty in the Indian subcontinent. He was a direct descendant of Emperor Tamerlane the Great (Timur) and Genghis Khan himself. The Baburnama tells the tale of the prince’s struggle first to assert and defend his claim to the throne of Samarkand and the region of the Fergana Valley. After being driven out of Samarkand in 1501 by the Uzbek Shaibanids, he ultimately sought greener pastures, first in Kabul and then in northern India, where his descendants were the Moghul (Mughal) Dynasty ruling in Delhi until 1858. The memoirs offer a highly educated Central Asian Muslim’s observations of the world in which he moved. There is much on the political and military struggles of his time but also extensive descriptive sections on the physical and human geography, the flora and fauna, nomads in their pastures and urban environments enriched by the architecture, music and Persian and Turkic literature patronized by the Timurids. This translation is based on that by Annette Beveridge, The Babur-nama in English, 2 v. (London, 1921), a modern translation is that by Wheeler M. Thackston, The Baburnama: Memoirs of Babur, Prince and Emperor (Washington, D. C., etc., The Smithsonian Institution and Oxford University Press, 1996). It is worth remembering that the miniatures reflect the culture of the court at Delhi; hence, for example, the architecture of Central Asian cities resembles the architecture of Mughal India. Nonetheless, these illustrations are important as evidence of the tradition of exquisite miniature painting which developed at the court of Timur and his successors. Timurid miniatures are among the greatest artistic achievements of the Islamic world in the fifteenth and sixteenth centuries. 3. Babur leaves Kesh and crosses the Mura Pass. 4. Babur takes Samarkand by surprise, July 28, 1500. 6. Ali-Sher Nawa’i, the famous poet. 7. Babur leaves Samarkand, July 1501. 9. Shabaq (Shaibani) Khan’s campaigns; winter conditions and mountain springs. 10. The acclaiming of the military standards according to Mongol tradition. 11. Babur’s poverty in Tashkent. The Memoirs of Babur – 1999 Daniel C. Waugh – Silk Road Seattle – an ongoing public education project using the “Silk Road” theme to explore cultural interaction across Eurasia from the beginning of the Common Era to the Seventeenth Century. Their principal goal is to provide via the Internet materials for learning and teaching about the Silk Road. Much is available here already: historical texts, well illustrated web pages on historic cities and architecture and on traditional culture of the Central Asian nomads, extensive annotated bibliographies of resources, an electronic atlas, and a virtual art exhibit drawing on museum collections from around the world.